RUMOR: Apple ‘iPhone’ photo leaked? Who ever coined the phrase “the devil is in the details” must of have been a genius. When I got the tip in for the image of the Mobile Me phone below, I immediately resized and crop the image without even bothering to look at the “whole” picture. Keep in mind that I got two tips in right around the same time; one was the video and this one. All this took place about 2 hours prior to announcement of the iPhone by Linksys. Looking over the image now, I missed a few key details. Do you notice the blurb on the bottom left? This image looks like it’s something an ad agency is putting together for Apple. So in my mind I’m thinking that Apple gave a bunch of info and images to the ad agency to play with…why else is this blurb in there? Full article with larger images here. This is a rumor and this photo could be a fake, but we cannot currently discount it (like most we see). One big point that may show it’s a fake is that it’s still there online. No demand by Apple’s legal eagles to take the image down should cause skepticism about this image’s validity. they wouldn’t tell the ad agency that its called iPhone, if they’re in the process of creating marketing they’d already have a name locked down. But, the above design is highly possible one! everyone is used to trackpad on the laptop; also you can track the finger above the trackpad even when the finger is not touching the trackpad. As long as the trackpad is back-lit; a lot would be easier. Although the above design is a fake, it is a good possbility. Fake! Chop! Bogus! Not real! Doesn’t look cool enough for an Apple product. Amateur spoof. looks cool. I don’t think it would be that functional though. I’m gonna say fake. Good one though. Very nice. 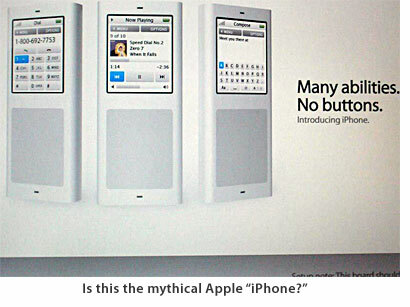 Apple has a huge design team that does a lot of their own marketing materials aside from the iPod campaign. I find it hard to believe that an outside agency worked on this. Looks interesting though, can’t wait for MacWorld! First off, that thing is ugly, mostly because of the large grey “trackpad.” Would it be possible it’s not actually a track pad but rather a grey box to cover up some innovative control feature? Who knows…. MW: Zipper … let’s unzip the wrap on Apple’s phone, baby! Who the hell cares? Jeez I can’t believe how eager Mac people are for “rumors” to make their day. It’s as though there is nothing else going on in their lives. Give it a freaking break. IF there is going to be an “iPhone” from Apple, THEY will announce it. Until then, all this focus on “rumors” is b*llshit. How can a rumor-monger refer to Windows users as the great ‘unwashed’, when they spend so much time chasing NOTHING. I am quickly losing any interest in MacDailyNews. THIS isn’t news. In fact, this is the last straw. MDN’s bookmark has been removed. Let me know if MDN decides to become a news site, and not a purveyor of unsubstantiated crap.